Jesus left that place and went to the area of Tyre and Sidon. A Canaanite woman from that area came to Jesus. The woman shouted, "Lord, Son of David, please help me! My daughter has a demon inside her, and she is suffering very much." But Jesus did not answer the woman. So the followers came to Jesus and begged him, "Tell the woman to go away. She is following us and shouting." 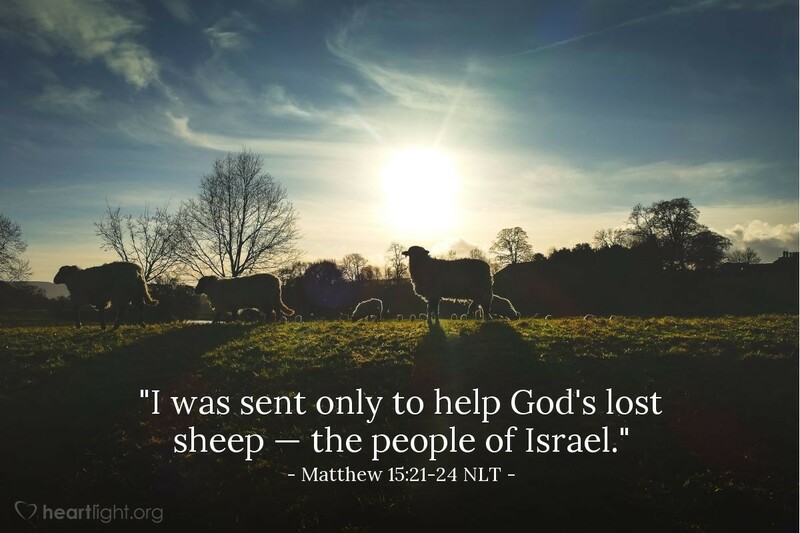 Jesus said, "God sent me only to the lost people of Israel (the Jews)." Jesus' mission was expressly to the Jewish people. Yet as the leaders of the Jews reject him, there are seekers who come searching for the Messiah. They will not be put off just because they are not Jewish. Here is a woman who had no right to the blessings of the Jewish people, yet she greets Jesus with Messianic titles and calls him Lord three times in today's verses and the following ones! Unlike the "religious" leaders, she is an earnest seeker. She is the reminder that seekers can find, even when the time is not right. As the following verses show, her faith is great, like another Gentile we meet in this Gospel. (Matt. 15:21-28) Both are reminiscent of God's love for foreigners trumpeted in the Law, the prophets (Isaiah 56:1-8), in the book of Jonah, and in the small book of Ruth. They are reminders that Jesus' ultimate mission is to the whole world. Give me eyes, O God, to see peoples of every nationality and language and culture as precious. I know you love all people. Give me that same love. In Jesus' name. Amen.